Who changed their random number guessing program to include a count of how many guesses were used to get the right answer? What other changes did you make to your program? Teacher flips a coing while student guesses the answer. 1. Ask, "what do you pick? Heads or Tails? 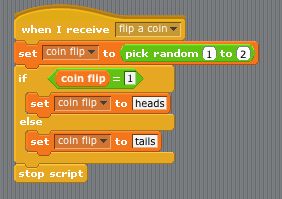 There are three steps required to guess coin flips. However those major 3-steps are broken down to sub-routines. In this lesson we will learn how to make the best use of sub-routines. 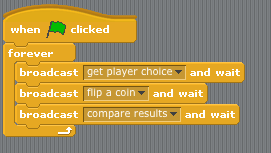 When we used Light-Bot in our first lesson we used functions to give instructions to the robot. Then create sub-routines for each type of broadcast. You must use the "and wait" command so the computer knows to wait until all sub-routines are completed. Also ALWAYS use a stop script command. 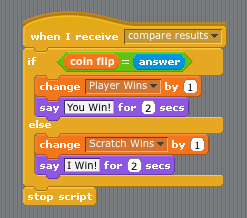 Use an if-else command so the program can decide if the answer was correct. 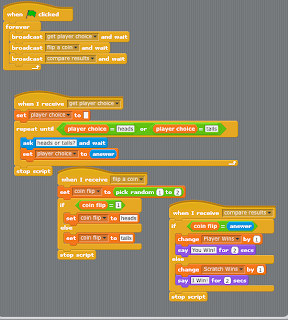 Make a new game. This time the game is Rock, Paper, Scissors. The program will be same as above but instead of only 2 random answers (heads or tails) there is a possibility of 3 random answers.